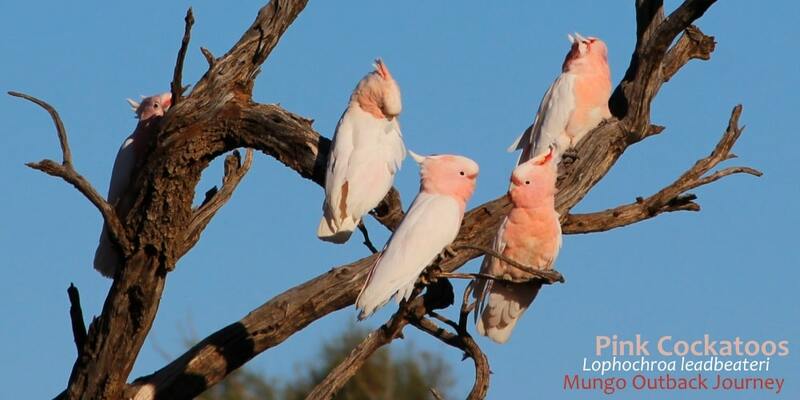 Pink Cockatoos: there’s something about them. Actually, there’s 5 things about them that make them very, very special. Its needless to point out that they are gorgeous. Just look at them. 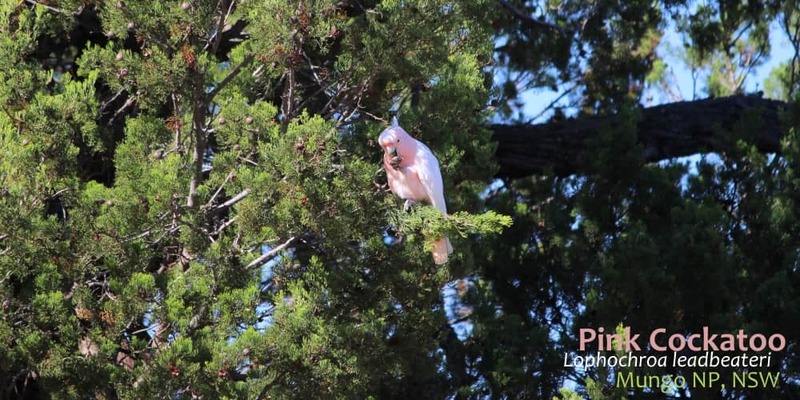 John Gould, pioneering ornithologist, called the Pink (Major Mitchell) Cockatoo the world’s most beautiful parrot. And he’d seen a lot of birds. Special thing #1. They’re rare. 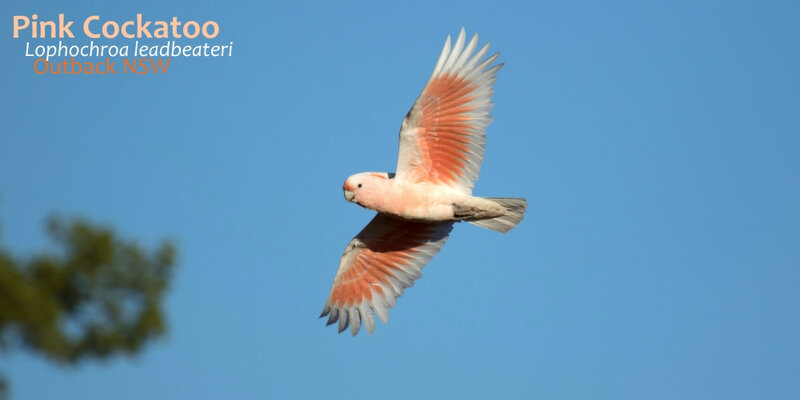 You can drive and walk for hours through perfect habitat and see hundreds of beautiful pink Galahs, white Little Corellas, dozens of Bluebonnets, green Mulga Parrots & Mallee Ringnecks and not a single Pink Cockatoo. See some of these other parrots of Mungo here. They are there, but their population is small and decreasing. Maybe they were never common, but with increasing dryness resulting from climate change, habitat destruction by rabbits and farming, and collection for the pet trade, these beautiful birds are rare. Which makes seeing a pair, or a flock of twenty, extra special. Special thing #2. They’re pink. 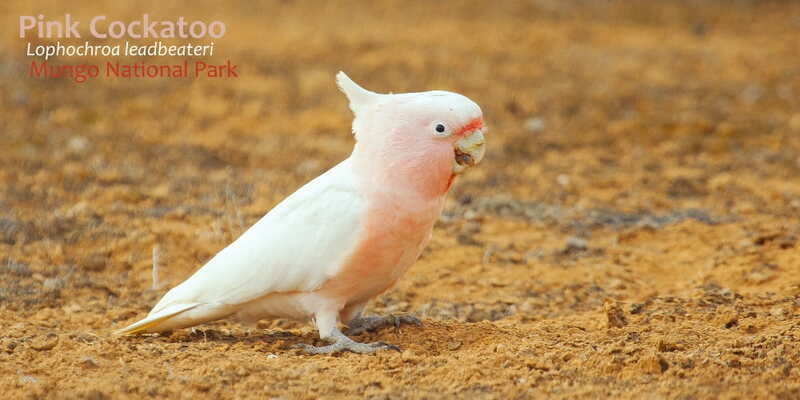 Pink Cockatoos are coloured with the most delicate palette of pinks. 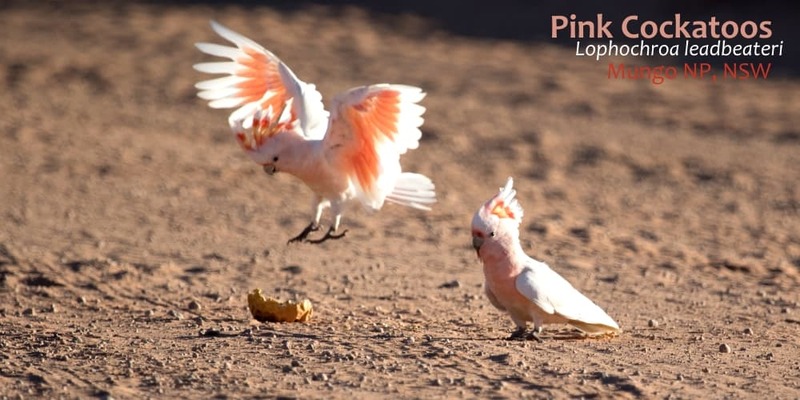 Their wings and tail are tinged strawberry-icecream pink, their body is pale coral, their underwings are deep salmon, and their crest…well, its out of this world. Two bands of watermelon, separated by a band of sunflower yellow. Special thing #3. They’re big. Cockatoos are big birds by any standards. 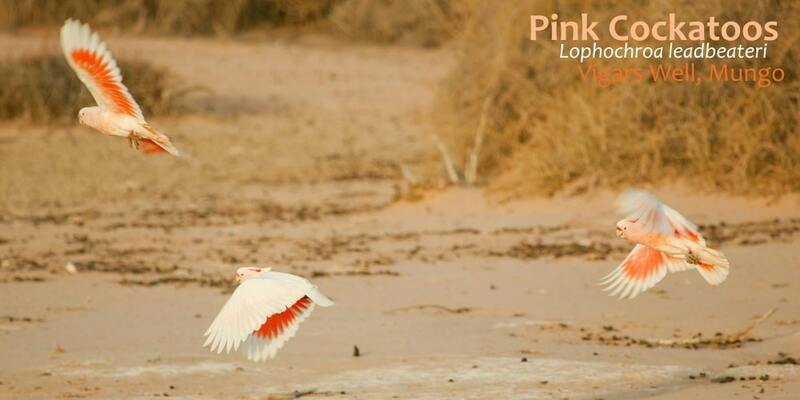 Pinks measure 35 – 40 cm from beak to tail, which is about the size of a domestic chicken. A lot of them is crest: mobile feathers on the head that, when raised, increase their size by about 10 cm! Special thing #4. They have the sweetest, silliest little call. Imagine: you’re walking through the red sand Outback with scattered native pines. Galahs fly by cheeping, Apostlebirds rattle and Chestnut-crowned Babblers babble. Then, a whispered squeak, so faint you might have imagined it. You look up, down, nothing. You hear it again and zero in on a dark green native Cypress Pine. Surely if there was a stunning huge pink cockatoo in there you’d see it…hang on…. Did that branch move? The world’s most beautiful parrots are shy and unobtrusive, and often only their thrilling, whispered call alerts you to their presence. Special thing #5. They live in the most Outback of Outback places. 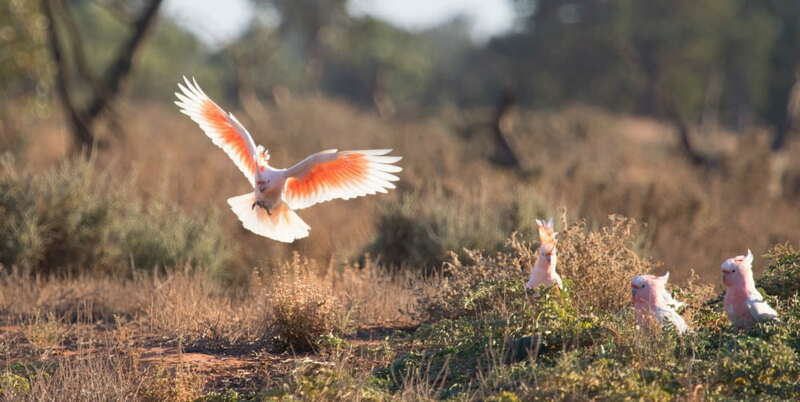 Pink Cockatoos like their Outback far, far from cities. 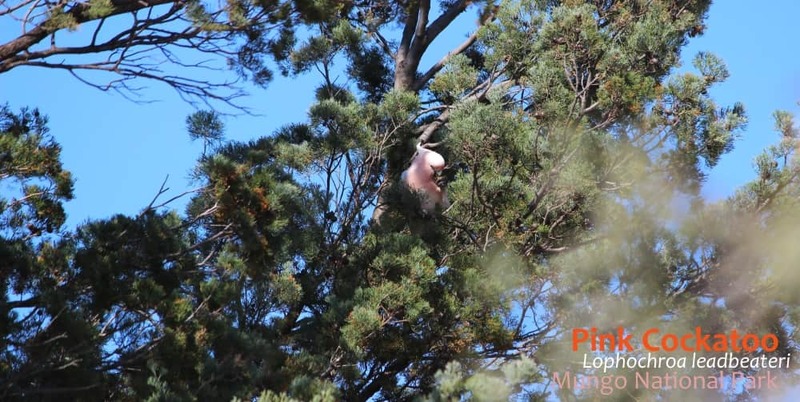 The nearest capital city to a Pink / Major Mitchell Cockatoo hotspot is Adelaide, and its 250km away. The live in arid regions with evocative names known only to locals: Big Desert, Mungo, Hattah, Yathong, Wilcannia, Yuendemu, Eucla, Nullabor, Woomera. Where the nearest town is a one hour drive and has one store that sells everything. To see the most beautiful cockatoos in the world you have to get out of the cities. 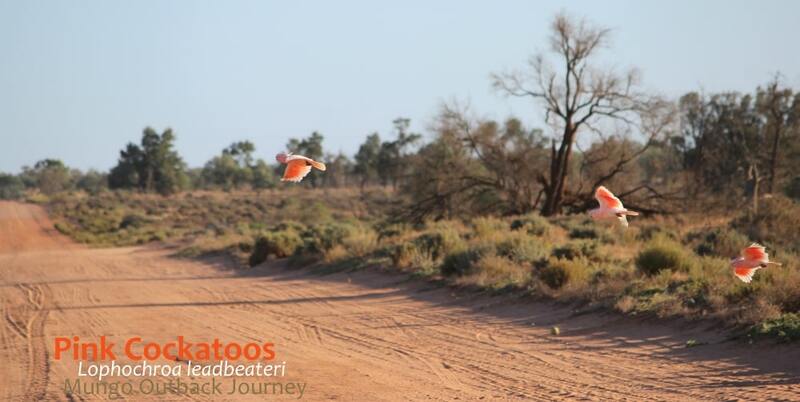 The 4 day Mungo Outback Journey is one of the easiest ways to see them. In April & May we even see big flocks of them! Love parrots and cockatoos? To see the biggest numbers and variety of species talk to us about linking the Wildlife Journey (11 to 14 species) and Mungo Outback Journey (11 to 13 species). This article is written in memory of Wildlife Guide, Wildlife Photographer and life-long wildlife protector Michael Williams, who passed away 10 March 2019.